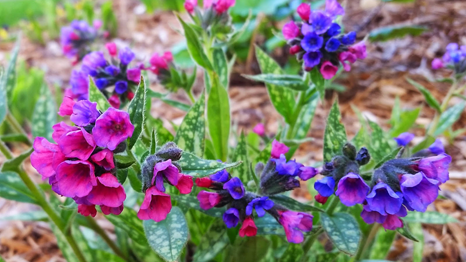 Pulmonaria officinalisis commonly known as Lungwort is an herbaceous evergreen plant of the genus Pulmonaria, belonging to the family Boraginaceae so is a relative of borage, comfrey, the alkanets, fragrant manjack and lasora as well as viper’s bugloss among many others. There is another plant called lungwort, (Lobaria pulmonaria) but that is a moss or lichen which is also called oak moss, because it grows on or under oak trees. The plant is native to damp habitats and coastal areas in Europe, Asia, North America, and Africa. Apart from Lungwort it is also known as Common lungwort, Jerusalem Sage, Jerusalem Cowslip, Sage of Jerusalem, Pulmonaire, Sauge de Bethlehem, Coucou Bleu Lungenkraut, Spotted Dog, Soldiers and Sailors, Joseph and Mary, Bethlehem Sage, Our Lady’s Milk Drops, Spotted Lungwort, Oak Lungs, Herbe aux Poumons, Pulmonariae Herba, lung moss, spotted comfrey, Adam and Eve, Bedlam cowslip, Beggar’s basket, Bugloss cowslip, Lady’s cowslip, Lady’s milk, Mary’s honeysuckle, Mary’s tears and Virgin Mary’s honeysuckle. 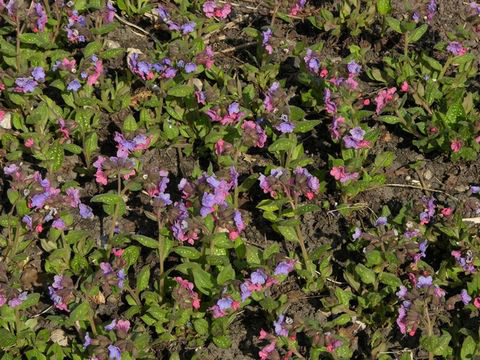 Lungwort is also known as “Soldiers and Sailors”, because it changes the color of the flowers from red to blue. Two-colored flowers can be seen at the same time, like the colors of the uniforms of British army (red) and navy (blue). The genus name of Lungwort was given by the German physician Leonhart Fuchs who is also considered the founding father of botany. Genus name comes from the Latin pulmo meaning lung. 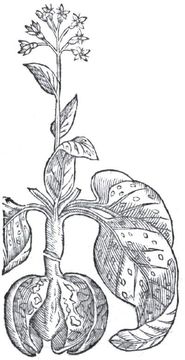 In accordance with the Doctrine of Signatures, genus plants were once believed by medieval herbalists to be an effective remedy for treating lung diseases because the spotted plant leaves supposedly resembled diseased lungs. It is, however, well established today that there is no valid basis for believing genus plants have any value as medicinal plants. Specific epithet means sold in shops. It is a natural plant that has been used around the world for a variety of respiratory ailments, including coughs, colds, bronchial detoxification and catarrhal problems. 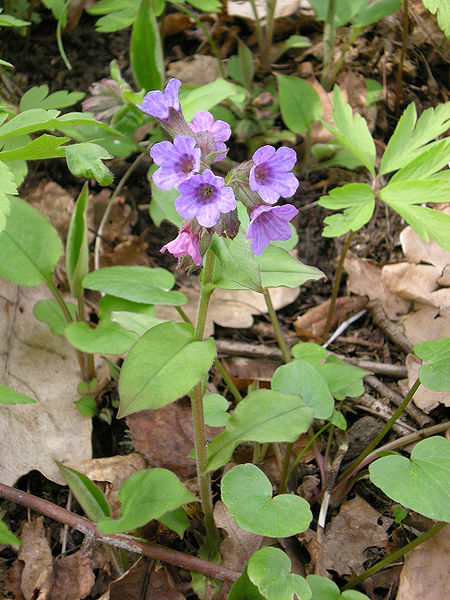 Because it’s very sensitive to environmental toxins, the areas in which it is found are typically unpolluted old forests, and thus, the presence of lungwort is often a good indicator of an ecosystem’s health. Lungwort is an herbaceous evergreen or semi-evergreen, perennial rhizomatous plant that grows about one feet or 30 cm tall and 30cm wide. The plant is found growing in damp open woodland, including oak, hornbeam, lime, sycamore and beech woods, and is also found scrub land. The plant prefers fresh and shady areas, nutrient-rich and mostly calcareous, stony or pure clay loam soils. The plant has upright, unbranched, hairy stem that can reach 12 inches in height. Stems are covered in downy hairs. 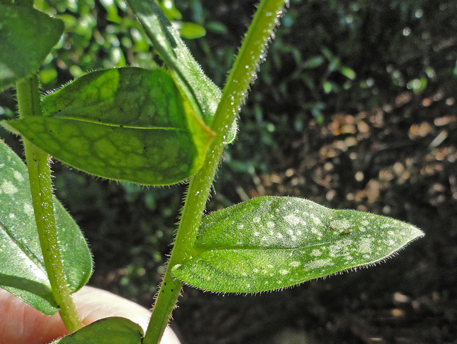 Basal leaves are green, cordate, more or less elongated and pointed and always with rounded and often sharply defined white or pale green patches. 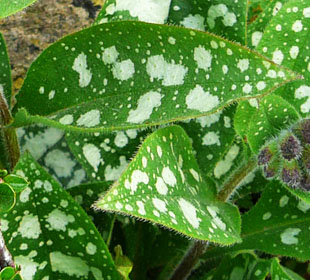 Leaves are covered with whitish-grey spots in the most species of lungwort and are quite hairy. Plant produces small bunches of flowers. Funnel-shaped 5-petals flowers are ¾ inches long and are red or pink at first, later turn to blue-purple during the anthesis, by changing the pH value inside of the petals. As a matter of fact the flowers contain a dye that belongs to the anthocyanins and change the color from red to blue. The flower can be white, red, blue and purple. Different colored flowers may be seen on the plant at the same time. Flowering normally takes place from March through May. Lungwort’s high mucilage content is known to be useful in respiratory conditions, namely asthma and, in particular, chronic bronchitis. 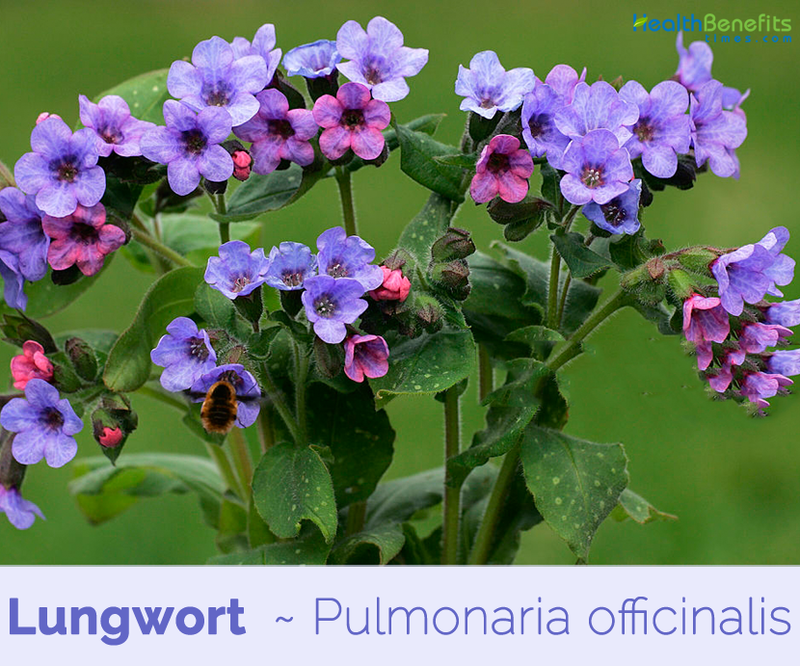 While there isn’t a ton of research currently available, it is widely accepted that lungwort can be used by people with these conditions–in conjunction with doctor recommendations–as a complementary approach. Digestive health is of supreme importance to your overall health and well-being. Many people suffer from digestive troubles such as bloating, constipation, stomach pain and dyspepsia but there are sufficiently of good, effective remedies to be found in nature. Drinking a soothing cup of lungwort tea can also help relieve a number of digestive and gastrointestinal problems including indigestion and diarrhea. Lungwort has mild diuretic properties which may help relieve the discomfort of bloating from excess water build-up while its astringent properties may also be responsible for treating attacks of diarrhea. As we all know that lungwort is a rich source of natural antioxidants, it can play a very important role in helping your skin remain stronger and younger but that is not all. 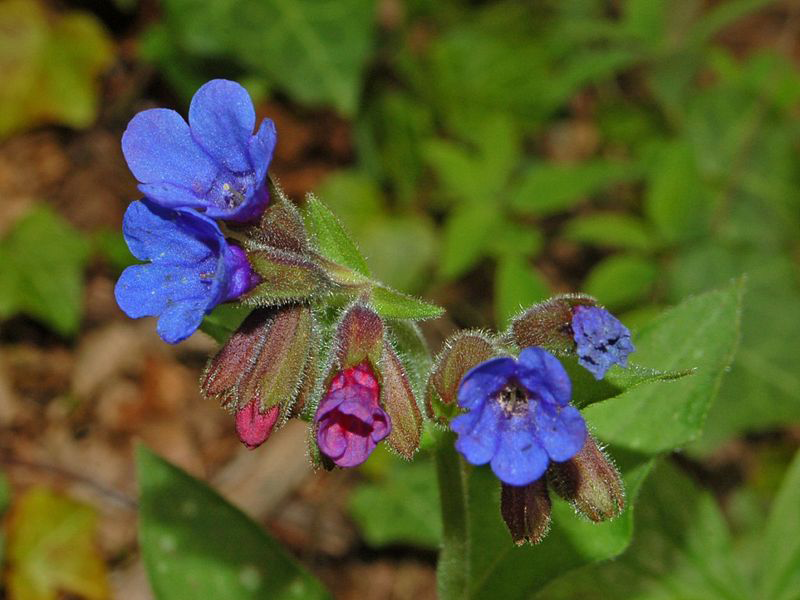 Lungwort can also be applied topically to the skin to help treat minor wounds and cuts. It consists of a chemical compound called allantoin that is known for its ability to heal tissue damage and expedite wound healing. Lungwort can also be applied to the skin topically. Lungwort is effective when applied to the skin because of its astringent and anti-inflammatory nature. It can be applied to the skin to treat a whole range of skin conditions including burns, ulcers, hemorrhoids, and eczema. Although we are lacking in any fixed scientific evidence, lungwort has been used traditionally to treat infections of the urinary tract like cystitis. Because of its natural diuretic ability, it has also been used to treat kidney complaints. Diuretics or water pills are often recommended for urinary tract conditions because they help promote the production of fluids in the body and increase the frequency of urination. This can help expel toxins and relieve infection but prescription diuretics also bring a risk of adverse side effects. Plant is useful in the treatment of chest diseases and asthma. 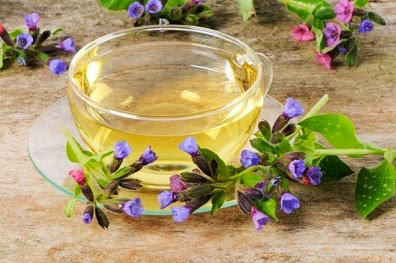 Lungwort has high mucilage content and this makes it useful in the treatment of chest conditions, being of particular benefit in cases of chronic bronchitis. It combines well with other herbs such as coltsfoot in the treatment of chronic coughs including whooping cough and can also be taken to treat asthma. Leaves and flowering shoots are astringent, demulcent, diaphoretic, diuretic, emollient, mildly expectorant and resolvent. They are often used for their healing effect in pulmonary complaints and their mucilaginous nature makes them helpful in treating sore throats. Leaves can also be used externally to stop bleeding. Distilled water made from the plant is effective eyewash for tired eyes. Homeopathic remedy is made from the plant. It is used in the treatment of bronchitis, coughs and diarrhea. Leaves have been supposed to be demulcent and pectoral, and have been used in coughs and lung catarrhs in the form of an infusion. It is beneficial for lungs and helps to clear the airways and expels the mucus from the lungs. It has anti-inflammatory and antibacterial properties that prevent viral or bacterial infection in the lungs. It is usually used in the form of a tea but can also be used topically on the skin to treat wounds and for overall skin care purposes. Lungwort Tea may help in the treatment of such lung diseases as tuberculosis, asthma, and coughs. Lungwort Tea may be helpful against bronchial disorders and sore throat. Lungwort Tea may help against bacteria responsible for chest infections. Lungwort Tea may help in the treatment of gastrointestinal and kidney problems. 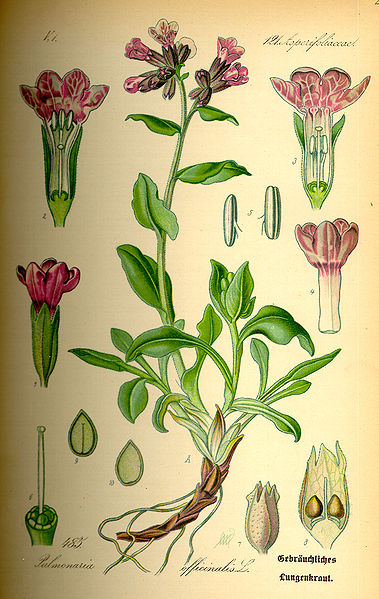 Lungwort Tea or tincture, when applied externally, may be used to treat eczema, hemorrhoids, wounds and burns. 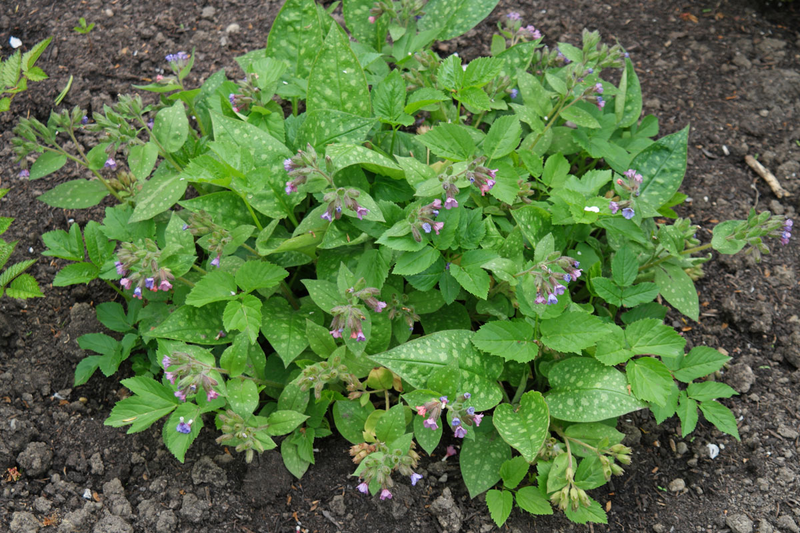 Some herbalists prescribe lungwort to control diarrhea. Chesty coughs, wheezing, and shortness of breath were thought to benefit from an infusion of the dried leaves. Distilled water prepared from this herb is known to be effectual eyewash for healing tired eyes. Homeopathic medication prepared from the plant is used to cure coughs, bronchitis as well as diarrhea. 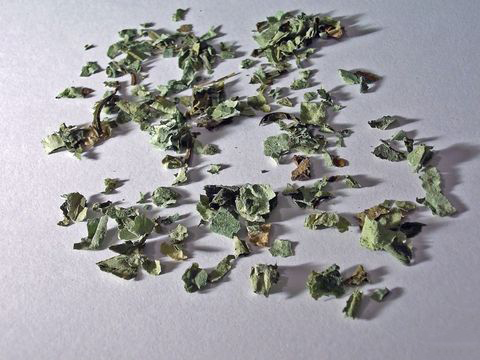 Lungs: Take 4 to 5 fresh lungwort leaves. Boil it in a glass of water for 10 minutes. Cool it and strain and drink this tea twice a day. They can be added to salads or used as a potherb. 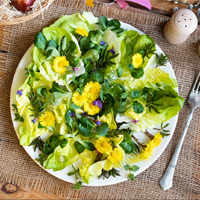 Leaves are low in fiber and make an acceptable addition to mixed salads, though their mucilaginous and slightly hairy texture makes them less acceptable when eaten on their own. Young leaves make a palatable cooked vegetable though we have found the texture to be somewhat slimy. 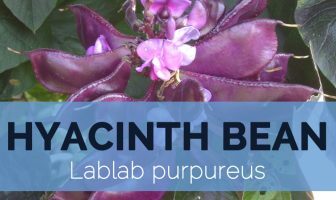 Aerial parts of the lungwort plant are used to prepare oral and topical formulations. The preparations are available as infusions, dried leaves, and fluid extract. The topical formulations should be applied to affected area(s) only. It is a tolerant and slow growing ground cover plant for open woodland and border edges. 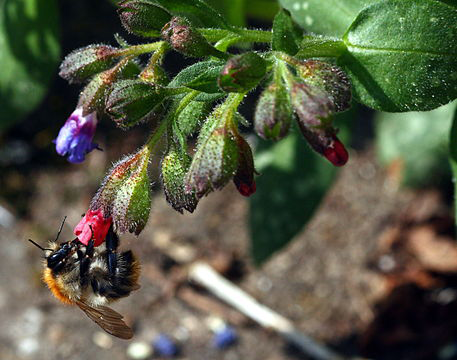 Lungwort is important food source for larvae of certain insects and moths. Excess use may cause menstrual disorders, upset stomach and skin Inflammation. Lungwort might cause a rash in some sensitive people. This herb and tea are also not recommended for long-term use. Arrange the lettuce on the base of a serving dish and top with the sliced eggs. Top the eggs with the mixed salad leaves. Mix together the spring onions, mayonnaise, lungwort leaves and seasonings in a bowl. Use this to top the salad and serve immediately. Place the butter in a large soup pan and heat to melt. When nicely melted and sizzling add the celery, onion, parsley, bell pepper and garlic. Fry over a low flame for about 20 minutes, or until the onion is soft and golden then add the flour and lungwort leaf powder. Stir the mixture constantly for about ten minutes to form a roux then add the stock and bay leaves. Bring to a simmer then cook for about 20 minutes before adding the ham, fish and sausage. Continue cooking for a further 30 minutes. Bring to a boil, stirring constantly then add the prawns and thyme. Continue cooking for about 2 minutes then adjust the seasonings and serve on a bed of rice. Flower Plant produces small bunches of flowers. The 5-petals flowers are red or pink at first, later turn to blue-purple during the anthesis, by changing the pH value inside of the petals.